The Episcopal School of Dallas is grateful to announce a generous gift from current parents Lori and Jerry Jones Jr. in support of the Lower School. This gift helped confirm the Board of Directors' decision to authorize moving forward with construction. The first visual sign will be the perimeter fencing around the site that will go in place on May 17. Construction is anticipated to begin soon after school dismisses for the summer. "The design for this space is extraordinary and will set a new standard for early childhood and elementary education across the nation," said Don Carty, Chair of ESD's Board of Directors. "It is exhilarating to realize Father Swann's vision of One Campus, One Community. The Board is enormously grateful to the campaign leadership of Nita Clark and Suzanne McGee, the tremendous donor support, the incredible design thinking of our teachers and architects, and the careful planning of our executive team." At the beginning of this project, ESD committed to not breaking ground until achieving full funding in cash and commitments. The $36,500,000 required and raised includes approximately $3,000,000 in undesignated campaign gifts. 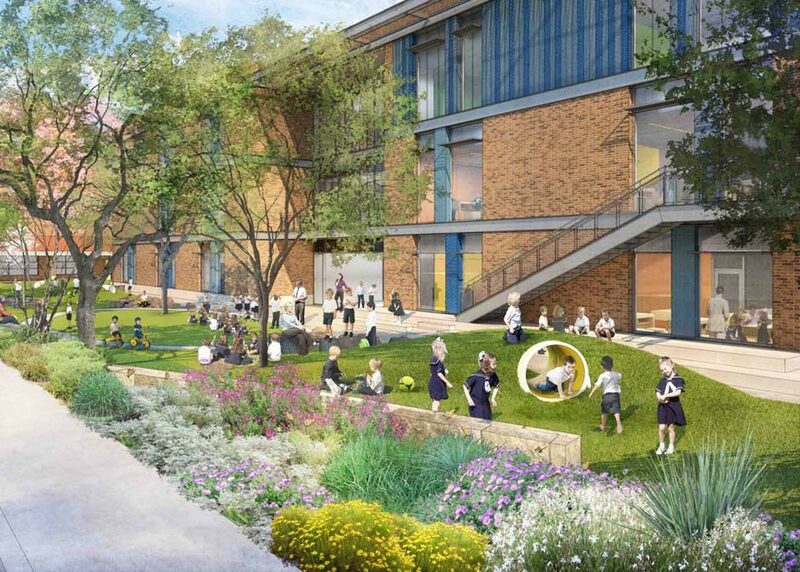 "Dallas is defined by the things in which its leaders invest – the arts, museums, sports, and its schools, colleges, and universities," said Jerry Jones Jr. "Lori and I proudly extend the Jones family's longstanding legacy with The Episcopal School of Dallas with our gift to the new Lower School. We have seen firsthand the incredible impact of the ESD education on the lives of students and graduates, and we are honored to help this tradition of excellence continue." Groundbreaking for the new Lower School, to be located south of the Susan M. Frank Center for Arts & Humanities and east of the Stephen B. Swann Athletics and Wellness Center, is coming soon. Completion is targeted by August 2019. Its innovative design supports creative collaboration, intellectual curiosity, and childhood wonder. Research and planning for this new space are direct results of ESD's strategic plan, ESD Tomorrow. "The results of our strategic plan and continued research and planning are now coming to fruition," said Ruth Burke, Assistant Head of School. "Our faculty and staff are engaging in strategic and logistical conversations to ensure the best possible outcomes in key areas including scheduling, sharing of human and physical resources between divisions, and supporting ESD traditions. This is an exciting and meaningful time to be a part of the ESD community." Every dollar raised in support of the Lower School, from now until the doors open, will allow undesignated dollars to go toward endowment, further strengthening the School's financial health. We invite those families interested in contributing to the funding or endowment for the Lower School to please contact Denis Stokes, Chief Advancement Officer, at 214-353-5806, or Nita Clark and Suzanne McGee, Campaign Co-chairs.